I started this series looking at the differences between print readers and web readers. This is critical to understand before moving forward with your online public relations material. We cannot expect to reach online readers the same way we reach those that are offline. We can't just do the old-world methods in a new-world medium. The differences between the two readers is vast, and, without that understanding, there will be no way to hit the goals you are trying to achieve. But once you have a firm grasp on who your online audience is, and how they react, you can begin to set attainable goals for your online PR. Every piece of content you create should have a goal in mind. What is it trying to achieve? What do you want people to do? How is this going to benefit your company? These and many other questions need to be answered before you even begin writing. Being online, we have to look at specific set of goals that are unique to the web. As we noted at the end of Part 1, there are three things we have to keep in mind: Search, Social, and Conversions. What goals do we need to have in place in order to be successful in each of those areas? Let's look at four goals of your online PR. These should help you in crafting better pieces of content designed for the internet audience. The idea of generating any piece of content is to get noticed. What's the point of writing if no one is going to see it, right? I mean, this isn't just an exercise in futility... we want people to read what we write, dang it! What you're looking for is the double take. 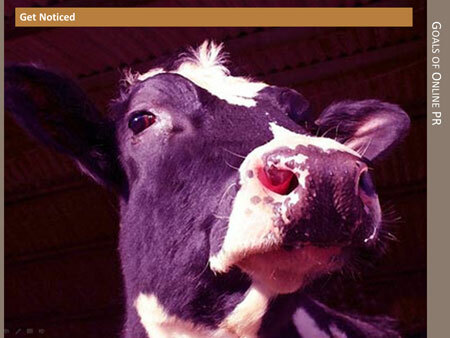 Imagine driving down the highway and suddenly you spot a purple cow. What the?! You're going to do a double take. That's what you want your online content to do, to stand out in a way that people go, "Holy purple cow, Batman, did you read that!" Now be careful. You don't want to lead people down a false path here. Don't pull a bait-and-switch. Once they do that double take, make sure the second take is every bit worth it. So, what happens next? What should your piece of content do once you get some eyeballs on it? That's brings us to goal number 2. 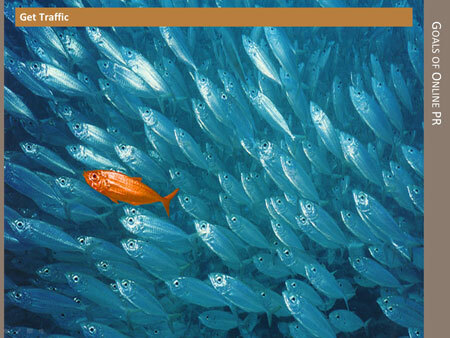 Traffic is essential to having a successful PR campaign. Your content may do a great job of getting noticed, but is that translating into traffic to your website? If not, then your "hot" piece has utterly failed. You want to make sure that people don't just read your single piece of PR then move on to something else. Your content should only be the teaser. It should act as a doorway into the real content: your website. Speaking in terms of food, you want people to move from the appetizer to the main course. Is your content interesting enough to keep people engaged with your brand? Is it creating traffic beyond the piece itself, or is it just a (dead) end unto itself? No content should be the end. Heck, even after an order for a product is placed, the goal then is to bring the visitor back to start the purchase process all over again. While your PR piece may be designed to inform, it also needs to have a reason to be informative. Information for the sake of information is what we call "useless knowledge." I already have plenty of that! Once you start moving people through the process from reading to engaging with your site, you have to then look at whether you are delivering the right traffic to your site. Which brings us to goal number 3. 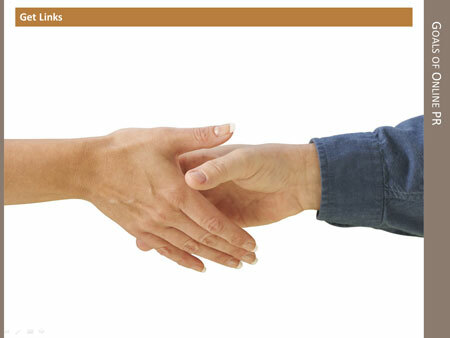 Getting customers is one of the key goals of any online business. Now I use the word "customer" loosely. That can be whatever is meaningful to you. A customer could be someone who buys your product, or someone who downloads your white paper, or engages with you in Facebook. A customer can be anything you determine it to be. It really depends on your industry and what you are trying to accomplish with your business. If you're not getting customers, whatever those are to you, what are you getting? Traffic? Hits? Page views? A round of applause? Is that enough for you, or do you want more than that? What is the content delivering for you, and how do you use your PR piece to bring new customers into the fold? "You mean I actually have to produce something that produces something?" Well, yeah. Content just for the sake of being read is nothing more than a bunch of words on the page. Every piece of content should speak to your potential customers, encourage them to engage, and ultimately lead them to that conversion point. Of course, not every visitor can turn into an instant customer. But there is a way to get them to become an evangelist for you, which leads us to goal number 4. The web is fueled by links. If no one linked to anyone, how would you find any content? Search engines? Well, they use links to find the new content. So, if they can't find it, then your audience can't find it either. That means your content not only has to produce customers, but it also has to get customers, and non-customers alike, to pass it on via links and social shares. So, how do you make link-worthy content? Well, there are three steps. 1) Get noticed. 2) Get traffic. 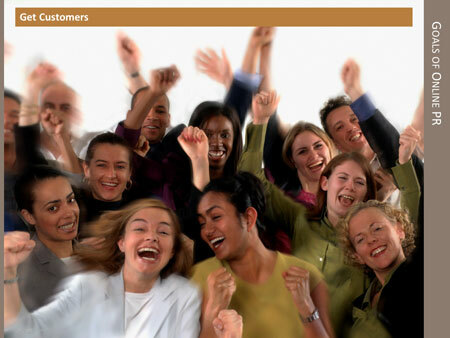 3) Get customers! If your content is doing those things, and the visitors that read each piece find the information in it valuable, then it is more likely to be passed, linked, or shared. And that's what you want. Why? Because the more your piece of content is linked or shared, the bigger potential it has of reaching more customers. More links means better rankings and more traffic from your target audience. More traffic means more customers. More customers means more links. It's a magnificent cycle to be in! Every piece of PR may have a different set of immediate goals, but the four goals mentioned above shouldn't ever change. These are your universal constants in the online marketing world. If your content isn't hitting these four goals, you need to rethink what you're doing. It's not that there is anything wrong with the writing itself, but perhaps you're not writing with the right goals in mind. Refocusing your content onto these new goals will help ensure that your online PR strategy lines up with a search and social world, which really just means it's doing the job it was intended to do. Great content will generate natural links over time, but that doesn't mean it couldn't use a little help! To help get your content noticed, you have to promote it. Don't just send that press release off into the Internet void. Cross promote it through various channels to help it along the way. 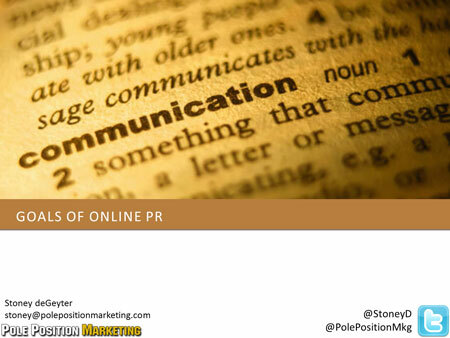 PR is such an important part of online marketing unfortunately not everyone understands how to approach it correctly. I speak with people all the time that try to approach it in the same fashion they would approach offline PR and that doesn't always work.